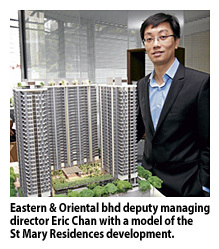 EASTERN & Oriental Bhd (E&O) will be launching three more condominium projects with a total gross development value of about RM1 billion, within the next six months. The projects will include the first phases of its properties in Kuala Lumpur, Johor and Penang, said deputy managing director Eric Chan. The Kuala Lumpur project is located on a half hectare land on Jalan Yap Kwan Seng, while the Johor one is the first part of the RM3 billion Medini Integrated Wellness Capital in Iskandar Malaysia. The Penang project is the group's second tower for its Andamam at Quayside condominiums. Chan told reporters this after a media briefing on its completed luxury lifestyle project, St Mary Residences, here yesterday. St Mary Residences, developed in partnership with the Lion Group, comprises 457-unit luxury apartments, and the E&O Residences Kuala Lumpur, which is the group's first serviced apartment project in Kuala Lumpur. It also has a retail centre of over 34,400 sq ft, which is expected to be fully occupied by the end of this year. Chan said, to date, half of the retail space had been taken up. The apartment units, which include 16 penthouses and four super penthouses, were sold between RM1.5 million and RM12.18 million. All the apartment units, said Chan, have been sold out while the penthouse units will be offered for sale soon. He said in collaboration with Lamborghini KL, buyers of the su-per penthouses will be offered an option to purchase a limited edition Lamborghini priced at RM1.68 million. Chan also said E&O for the next six months will provide information on the range of rentals, to owners of the units at St Mary Residences who will be getting their keys next week. "We will assist them in getting their units rented out for free for the first six months and we will work with valuers and property agents on this," he said adding that the rental price will be between RM5.50 and RM8 per sq ft. The smallest unit is a studio suite measuring 1,131 sq ft while the biggest is the penthouse unit with a size of 6,759 sq ft.
IPOH: Property developer Hua Yang Bhd expects to generate a revenue of some RM872 million, which would keep them busy for the next 12 years at the 196ha site in the fast developing Bandar Universiti Seri Iskandar (BUSI). BUSI, located at Perak Tengah district, about 30 minutes drive from here, was derived from educational institutions located in the area like Universiti Teknologi Petronas (UTP), Universiti Teknologi Mara (UiTM), Kolej Profesional Mara and others like Sekolah Menengah Teknik Seri Iskandar and National Youth Skills Training Centre. The company has a landbank of 335.3ha, of which 110.4ha had been developed to a tune of RM200 million, while the ongoing project covers 12.4ha, which is worth RM48 million. The latest project is the Pedestrian Mall, costing some RM12 million. The project, which is adjacent to Tesco hypermar-ket, comprises 123 units of two- and three-storey buildings, each priced between RM598,800 and RM1.56 million. "The retail shops at our new project site is built on a pedestrian concept," Hua Yang Perak branch manager Tony Ng said. The ongoing new phases include Tropika double-storey terrace houses, Bandar Universiti Business Centre (BUBC) and double-storey shop offices. Other projects in the pipeline are double-storey Sierra Homes and single-storey Seri Idaman units. The masterplan is to build an integrated lakeside township, complete with facilities, including commercial shoplots, hospitals, schools, educational centres, budget hotels, hawker centres and a clubhouse. GEORGE TOWN: A revamped "Oriental Village" in Teluk Burau, with additional features like an events hall and a canopy walk, is likely to emerge as part of the Langkawi Development Authority's (Lada) efforts to boost tourism products in Langkawi. Business Times has learnt that the existing Geopark Hotel Langkawi, which is sited in the grounds of the themed village, may also undergo a refurbishment and be turned into a boutique hotel. "It is likely that Lada will incorporate some of the elements outlined by Syarikat Prasarana Negara Bhd in its business plan for the potential takeover of Oriental Village's operations," industry sources said. Last year, Business Times reported that Prasarana was in talks with Lada for the proposed takeover in a bid to add value to Prasarana's cable car operations which were sited in the grounds of the Oriental Village on the resort island. Prasarana yesterday confirmed Business Times' report on Wednesday that it had handed back the cable car operations to asset owner Lada after operating for ten years. In a statement issued yesterday, Prasarana said the handover was formalised on Tuesday in Langkawi with Prasarana group managing director Datuk Shahril Mokhtar signing an agreement to sell off its shares in Panorama Langkawi to Lada Eco Tourism Sdn Bhd, a subsidiary of Lada to facilitate the change in ownership. The firm was represented at the signing ceremony by its chief executive officer Tan Sri Khalid Ramli. Prasarana was appointed by Lada to take over the operations of the Langkawi cable car services from Machinchang Skyways in November 2002, by bringing in its expertise to run the business. A year later, Prasarana set up Panorama Langkawi as a special vehicle to manage the operations and business. The handover of the cable car services is reportedly valued at RM3 million. "Through Panorama Langkawi, we have helped put the island and Langkawi Cable Car in particular on the world map. "For that, I would like to congratulate my team at Prasarana and also to now my former staff at Panorama Langkawi," Shahril said in the statement. He also expressed hope that Lada will continue Prasarana's good work and to build on the fact that the cable car services have become a tourism icon for the island. KUALA LUMPUR: UDA Land Sdn Bhd, a subsidiary of UDA Holdings, aims to achieve RM2bil in gross development value (GDV) from Phase 4 of the Suaindah development in Bandar Tun Hussein Onn by 2016. Chief operating officer Mohmad Sallihhudin Barlin said the GDV would be derived from high-end properties planned to be built in the area, including bungalows, semi-detached houses, condominiums and commercials.